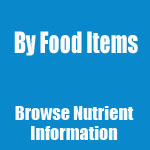 The Food Nutrient Finder is for browsing information about a specific food or nutrient. To estimate the nutrient intake from selected foods using the available data from NIIS, go to the Food Nutrient Calculator. 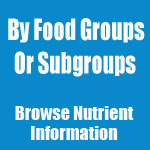 Read the User Guide before browsing the information by Food Groups/ Subgroups or by Food Items. Institute of Nutrition, Mahidol University, Thailand (FCD2002). The databases will be kept updated with the latest information from available sources. Nevertheless, users should note that the nutrient content of the same food may vary and is dependent on many factors such as the food processing methods, sources of the food supply etc..
CFS has made the best effort to ensure the information provided by the various sources is accurately reflected in the database. The information (e.g. food names) for SR22, NUTTAB2006 and FCD2002 has been translated into Chinese. If there is any inconsistency or ambiguity between the English version and the Chinese version, the English version shall prevail. Food items are categorised into 24 food groups, each divided into a number of food subgroups (if available). Similar food items are grouped into the same food subgroup. For example, chicken wing (food item) is classified as “poultry and poultry products” and “chicken and chicken products” under the food group and food subgroup respectively. This database also provides the nutrient content of 3 special food groups and result tables of 10 nutrition-related risk assessment studies conducted by CFS. Some new features have been adopted to make the searching more interactive and user-friendly. The content of a particular nutrient in a food item is expressed as the amount of the nutrient per 100 g edible portion of the food concerned, unless otherwise stated. The information in the Reference Measure (Unit and Unit Weight) on both Trans Fatty Acid Content of Local Foods table and Alcohol Content of Local Alcoholic Beverages table is from different sources including various food composition databases and for reference only. The value of energy provided by NUTTAB2006 is in kilojoules (kJ), which is converted to kilocalories (kcal) in this database system using the conversion factor suggested by NUTTAB2006 (1 kcal = 4.18 kJ). The value of carbohydrate represents the total carbohydrate content of food provided by SR22 and CFC2002Ed2; and that represents the available carbohydrate content of food provided by NUTTAB2006 and FRL. The value of dietary fibre represents the total dietary fibre content of food provided by SR22, NUTTAB2006, and FRL; and that represents the insoluble fibre content of food provided by CFC2002Ed2. “NA” stands for relevant nutrient data for that particular food item is not available. “ND” stands for relevant nutrient data for that particular food item is not detectable. “Trace” stands for appropriate relevant nutrient data for that particular food item is in trace amount. Users could choose one of the 24 food groups (or their corresponding food subgroups) to display energy and 9 core nutrients for foods under the selected food group/ food subgroup. The 9 nutrients are protein, carbohydrate, total fat, dietary fibre, sugars, saturated fat, trans fat, cholesterol and sodium. Information could be sorted in alphanumerical order when a relevant field is clicked (▲indicates the field is activated and being sorted in an ascending order, and ▼indicates a descending order). Display energy and 18 nutrient data on a specific food in the selected food group/ subgroup: when click on 1 food name, the data will be displayed in a separate table, with the same output as ‘Browse by Food Items’. Display local alcohol data on alcoholic beverages: the data will be displayed in a table at the bottom of the nutrient information table of the alcoholic beverages. Display local trans fat data on available foods: the data will be displayed in a table at the bottom of the nutrient information table of the selected food groups/ subgroups, if available. Major components: Protein, carbohydrate, total fats, dietary fibre and sugar. Lipids: Saturated fat, trans fat and cholesterol. Minerals and Vitamins: Calcium, copper, iron, magnesium, manganese, phosphorus, potassium, sodium, zinc and vitamin C.
Users could type in a food name into one or two text boxes for displaying its energy and the 18 nutrient data. As of 31 Jan 2013, pictures of 41 fresh fishes were collated from the Agriculture, Fisheries and Conservation Department (AFCD), and the Fish Marketing Organization (FMO). As of 31 Jan 2013, pictures of 83 fresh vegetables were collated from the Vegetable Marketing Organization (VMO). Users could browse the pictures via the respectively food group/ subgroup or via key word search shown at the top of the food group/ subgroup (if relevant) page. In a row of the food item’s nutrient information tables. Users could browse a particular food item’s nutrient information by searching their corresponding alias.